Fixed star Aldebaran, Alpha Tauri, is a 0.9 magnitude giant orange star in the Left Eye of the Bull, Taurus Constellation. The traditional name Aldebaran is from the Arabic word الدبران (al-dabarān) which means the follower (of the Pleiades). It gives honor, intelligence, eloquence, steadfastness, integrity, popularity, courage, ferocity, a tendency to sedition, a responsible position, public honors and gain of power and wealth through others, but its benefits seldom prove lasting and there is also danger of violence and sickness. This is one of the four key stars in the heavens, also called Archangel stars, Michael in this case – military commander of the Heavenly Host. It was also called “Watcher of the East”, possibly since it is the bull’s eye, though each of the Archangels is a “Watcher of”; Gabriel (Fomalhaut) of the South; Raphael (Regulus) of the North; Oriel (Antares) of the West. At one time they marked the two Equinoxes and two Solstices. To Ptolemy, Aldebaran was a Mars-type star, and indeed the red giant can be mistaken for that red planet at times, so it is no surprise that it has been much associated with war and military careers, and “The Follower”, as its name translates, can well be taken to imply following in the steps of the celestial general, Michael. 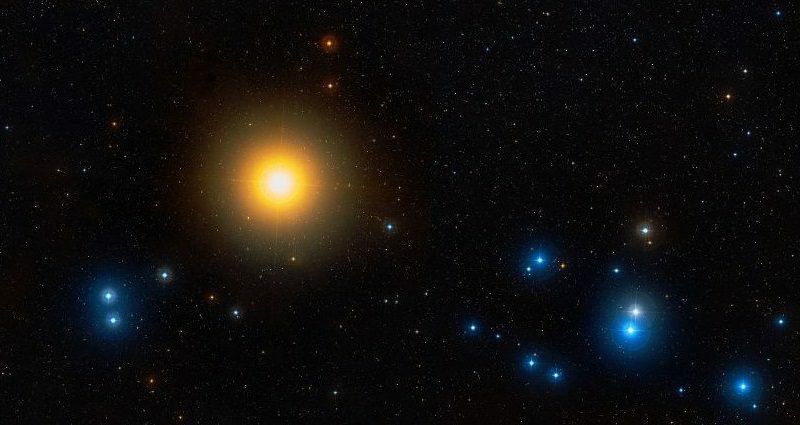 The idea put forward by some mundane-minded astronomers, that the name means only the star comes soon after The Pleiades star group, makes little sense since every star follows some other in that manner. Jupiter conjunct Aldebaran: Great ecclesiastical honor and high military preferment. This position brings recognition or glory to these individuals that is not earned. They have not rightfully worked to earn it. Unless they have pursued a conscious path with this configuration, all will be lost eventually. Generally, these persons use the negative side of this position and become very lazy. The negative side of Jupiter is laziness. 1. Star Names, Their Lore and Meaning, Richard Hinckley Allen, 1889]. 2. Fixed Stars and Constellations in Astrology, Vivian E. Robson, 1923, p.119-122, 233, 242. 3. The Living Stars, Dr. Eric Morse, 1988, p.35,36. 4. Fixed Stars and Judicial Astrology, George Noonan, 1990, p.34. 5. Fixed Stars and Their Interpretation, Elsbeth Ebertin, 1971, p.22,23. 6. The Fixed Star Health and Behavior Imbalance, Ted George and Barbara Parker, 1985, p.26. That was written by Vivian E. Robson in 1923 without the aid of astrology software to compare thousands of charts. I will add celebrity examples to all these fixed star conjunctions eventually. What is the number associated with AlDebaran?